Stephen William Hawking is a Commander of the British Empire, a Fellow of The Royal Society and a Member of the US National Academy of Sciences, he has held the post of Lucasian Professor of Mathematics at at Cambridge University since 1980. Stephen W Hawking is the author of many impressive works including the best seller 'A Brief History of Time'. 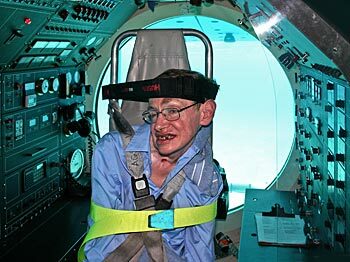 Stephen Hawking onboard 'Atlantis 15' a high tech submarine diving in 'Snapper Valley'. We would like to thank Stephen Hawking for allowing this picture to be taken and used here, also for his massive contribution to mankind's understanding of the universe, equalled only by the likes of Newton and Einstein. We hope this free picture will be of use to you! Siteseen Ltd. are the sole copyright holders of this Stephen Hawking picture, unless otherwise stated. We only authorise non-commercial picture use and particularly encourage their use for educational purposes. This Stephen Hawking picture is not in the Public Domain. 3) Use of this Stephen Hawking picture, or any of our pictures on websites re-distributing copyright free material is strictly prohibited.